With dazzling technology and supercar-humbling acceleration, the Model S foreshadows our fast and fun automotive future. The 2019 tesla model s electric vehicle qualifies for a federal tax credit of up to $7,500, effectively reducing the net base price. 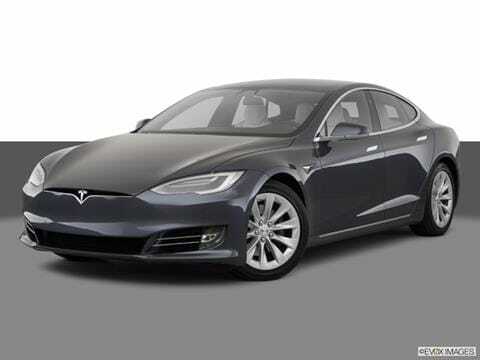 The Tesla Model S is an all-electric 5-passenger hatchback that offers up to 335 miles of range. The fact that it runs on electricity merely hints at the Model S’s cutting-edge technology. Inside, a minimalist interior is dominated by a huge 17-inch screen used to control virtually all vehicle functions. Tesla has championed autonomous-driving technology and regularly rolls out new vehicle features via over-the-air software enhancements. Meanwhile, a pair of electric motors generates massive torque permitting this sensible but sleek car to outrun many honest-to-goodness supercars. For long-distance travel Tesla’s Supercharger network provides rapid charging on the go, with thousands of chargers strategically located throughout the United States and Canada. It’s not a perfect car but the Model S foreshadows our fast and fun automotive future. Whether you value environmentally friendly transportation, find vision-bending acceleration intoxicating, or simply love owning the latest technology, the 2019 Tesla Model S is sure to dazzle. If you lack the ability to charge your vehicle at home or work, the electric Model S may not mesh with your lifestyle. Tesla also lacks a traditional dealer network, requiring some adaptation on the part of owners during the buying process or when it’s time for maintenance and repairs. Tesla doesn’t do model-year specific upgrades. So far during 2019 it has reduced prices and overhauled the naming structure for the Model S lineup. Tesla also ended its Supercharger credit program in late 2018, meaning new Model S owners must now pay to use Tesla’s vehicle charging network. The Model S comes in three forms ranging from merely quick to positively absurd. The raciest Performance trim can run from standstill to 60 miles per hour in a stunning three seconds. Spend an extra $20,000 for “Ludicrous Mode” and that number drops to 2.4 seconds, a quicker sprint than virtually any car on the road. In motion, a lack of engine noise imparts the Model S with a serene demeanor, supported by good ride quality and agile cornering due in part to a low center of gravity. Spring for the $3,000 Autopilot option and you can, in certain situations and with constant supervision, relinquish braking, steering and acceleration duties to the car. While lacking the finesse and forethought of a human driver, the Model S’s self-driving abilities are remarkable to behold. Words fail to describe the wonders of Ludicrous Mode. When active, flooring the accelerator causes the Model S to surge forward with intense, relentless thrust rarely experienced beyond the worlds of aviation and space travel. Downsides? Ludicrous Mode is offered only on the priciest Performance trim…and it costs a hefty $20,000. Included with the Full Self-Driving package, Tesla’s new Enhanced Summon feature allows the Model S to autonomously drive itself to its owner’s location (e.g., departing a parking space and retrieving its owner at the front of a store). We look forward to verifying those capabilities in the near future. The interior is dominated by a standard 17-inch touch screen used to control the climate system, infotainment, and essentially all vehicle settings. Fast-reacting and cleanly arranged it’s a beautiful and updatable interface that’s easy to love. With its hatchback design, the Tesla Model S offers ample cargo space behind its 60/40-folding rear seats, supplemented by a sizable underfloor storage bin and a roomy front trunk, or "frunk" as Tesla calls it. While fit and finish can be inconsistent, the cabin has a simple modern vibe offering comfortable seating in all positions. Even though its fundamental shape debuted in 2012, the Model S remains one of the most striking cars on the road. Highlights of its design include retractable door handles that emerge when the key is nearby and a recharging port that's hidden in the taillights. Standard wheels are 19-inchers, but fancy 21-inch carbon wheels are offered for a cool $4,500. Where paint is concerned, if you want any color other than black it’ll add between $1,500 and $2,500 to the purchase price. Among the standard features found on a “basic” 2019 Tesla Model S are automatic emergency braking, a power-rear hatch, heated seats for all passengers, eight airbags, a glass roof, and an air suspension that raises and lowers the vehicle. The Model S also has the most advanced starter system imaginable: There's no "Start" button -- you simply climb in, shift into gear, and start driving. Owners can also enjoy a variety of “Easter Eggs” including a roaring fireplace or classic video games displayed on the standard 17-inch touch screen. Besides wheel, paint and interior theme choices, the only options are Autopilot for $3,000 ($4,000 after delivery) and a Full Self-Driving Capability package for $5,000 ($7,000 after delivery) that bundles automatic parking, Summon (discussed in our Favorite Features), and Navigate on Autopilot that can guide the Model S from freeway onramp to offramp, handling all driving in between. In our experience, monitoring Navigate on Autopilot’s operation was more stressful than simply driving ourselves but future software updates should refine the system’s operation while adding new features. Tesla promises automatic city driving plus street-sign and traffic-light recognition later in 2019. All Model S variants feature all-wheel drive, facilitated by separate front and rear electric motors. Tesla doesn’t offer specific power numbers but given their staggering speed, power is plentiful. The Long Range Model S sprints from motionless to 60 mph in a scant 4.2 seconds, while the Performance model’s 3.0-second 0-60 sprints and 155-mph top speed make it a legitimate performance car, which just happens to seat five in comfort. Reserved for the Performance Model S with Ludicrous Mode is Ludicrous Plus, a feature that preheats the battery (this took about an hour in our test) for maximum performance, increasing acceleration slightly while potentially accelerating wear of the battery and electric motors. Fun! A 2019 Tesla Model S Long Range has a Manufacturer’s Suggested Retail Price (MSRP) of about $86,200, including a $1,200 destination charge. For the high-power Performance trim, you’ll spend around $100,200 plus another $20,000 on top of that if you want Ludicrous Mode. For the record, you want Ludicrous Mode. Fully equipped, the price for a Tesla Model S Performance trim peaks over $130,000. Where the competition is concerned, the zippy Jaguar I-Pace undercuts the Model S with a roughly $70,000 starting price. The Chevrolet Bolt and Nissan Leaf offer electric-car ownership at even lower price points but neither can match the Model S’s dynamic verve. A possible compromise is the Tesla Model 3, which generates Model S-like thrills in a smaller, cheaper package. Kelley Blue Book isn't currently tracking residual values for the Tesla Model S because of its low production volumes, though exclusivity generally leads to higher resale value. I'll never go back to gas. A modern spaceship on wherls!! I live in the north east and it handles really good in the snow and all seasons.